If you're looking for exceptionally-tasty novelty chocolates in all sizes, shapes and flavors, Dou Dou Handmade Chocolates is one of your best options. 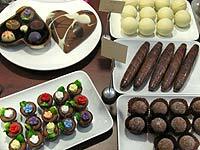 Manufactured in Australia by Colefax Chocolates, using the highest-grade (and most expensive) Belgian Callebaut raw chocolate, Dou Dou's large variety of sweet treats will delight adults and children alike.. Among 45 types of milk, dark and white chocolate, there are chocolate penguins, mobile phones, koala bears, wombats, lips, cars, cigars, golf balls, hearts, frogs and much more. 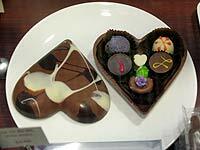 Flavors include the "fiesta" chocolate, with a hint of spicy red peppers, plus various liqueurs like Cointreau. Customers can pick and choose to create their own sample boxes, at a cost of NT$350/100 grams. Of note are the NT$400 organic chocolate bars, kids' chocolates made with no extra sugar or preservatives, and--for that extra-steamy romantic gift--kamasutra chocolate bars, engraved with scenes that the kids should definitely not see. Dou Dou is housed inside a large glass building that is part of a car-wash business opposite the Feng Le Sculpture Park. 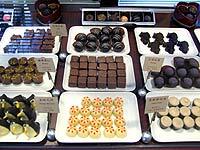 Inside, customers can browse through chocolates in a special climate-controlled display room or relax at a table with a good cup of coffee.